Rugs are among the oldest household items that have been in use since the 5th century, and continue to be used to this date. All what has happened to rugs is how they are designed and manufacturing techniques. To the untrained eye, differentiating the key differences between traditional and contemporary rugs can be very hard, as they all look almost alike. Nevertheless, looking keenly at the same shows a sharp difference and contrast. This makes it imperative to pay close attention when shopping for these rugs to find the best one to buy, for decorating your home. Traditional rugs are mostly recommended/used in conventional homes while contemporary rugs blend very well in modern designs and concepts. Since most retailers/suppliers may not know the difference, it is your responsibility to discern which is contemporary or traditional. Telling the difference between traditional rugs and the contemporary ones is however not that hard, as very little knowledge and practice is required. Buying these for the first time may however be confusing, which is why you may need to ask someone who understands these to help you out. The storekeeper for one may be good at discerning between the two. With a little training, you too can be able to tell the difference. Here are a few tips to enlighten you. What you need to look out for in contemporary rugs is the design and patterns used. Geometric and linear outlines were introduced just a few years ago, hence a distinctive way to identify contemporary rugs. 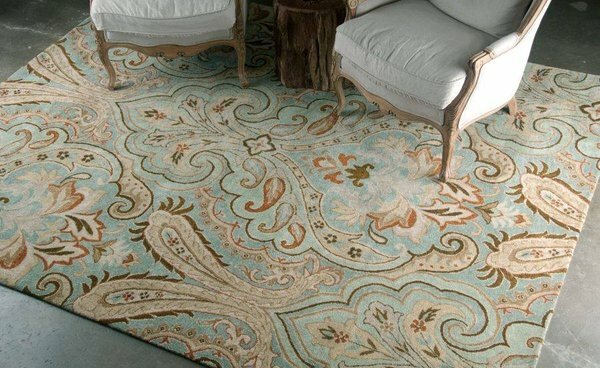 Patterns used in these rugs are mostly animal figures and plants such as lotuses. This however depends on the designer as one may decide not to use any print within the same. Traditional rugs on the other hand follow simple designs, and any imprints be used on the same, they are not as vivid as those in contemporary rugs are. Traditional rugs, on the other hand, tend to blend in with the environment while contemporary ones stand out. They are pale and do not have the captivating appeal used on rugs designed today. Contemporary rugs use intricate and optical illusions, which make them even more captivating. Another distinct difference between these two is comfort-ability. Since no chemical treatments are used on traditional rugs, they are less comfortable, aren’t water repellent or dust-proof either. As technology has fine tuned how rugs are manufactured and designed, contemporary rugs are made using synthetic fibers (olefin and polyester for example), which makes them resistant to fire, dust and even water. This means these rugs are resilient and do last much longer. Shape can also be used to determine whether a rug is traditional or contemporary. Traditional rugs for example are plainly rectangle, while contemporary ones can come in any shape. You can even make a custom order of the same, with shapes ranging from round, oval, square or even contoured. Contemporary rugs can be woven to go around appliances on the floor such as fridges, washing machines and even wall units. Depending on what your preferences are, and your budget of course, you can get almost any design you need from a contemporary rug. Traditional rugs can also provide comfort especially if you are conservative and do love them. The tips discussed above should give you an idea of what to look for when shopping for rugs.